The thing about change is that once it takes hold, there is no stopping it. Myanmar is a good case in point. NOT a day goes by without some foreign dignitary visiting, promising assistance and to ride shotgun on the reform process. In recent weeks, Myanmar played host to the UN secretary-general, the EU foreign policy chief and the Canadian, German and South Korean foreign ministers. In just a few months, Myanmar has received more high-level visitors than some Asean countries have in a decade. Sanctions are also being rapidly removed or suspended. An informal gathering of multilateral organisations and bilateral donor countries scheduled for mid-May is expected to result in billions of dollars of economic assistance. Myanmar will almost certainly be a different country by the end of the decade. In this sense, the democracy dividend is already real and far too significant for the generals to ignore. More than anything else, however, it is the palpable sense of excitement and optimism among the people themselves that is significant. The country is literally coming alive. Yangon itself is no longer the sleepy backwater that it was just a few years ago. The streets are clogged with newly imported cars. Construction is booming and business is flourishing. Even the poorer areas on the far outskirts of the city, which I visited, are being impacted. Of course, Myanmar remains one of the poorest countries in the region and has a long way to go but clearly the journey forward has already begun in earnest. To be sure, there are lingering doubts about the commitment of the generals to the reform process and much remains to be done but an unstoppable momentum for change has been unleashed that itself is irreversible. There might be hiccups and bumps along the way but clearly there is no going back. The last time I saw such momentum for change was when I was assigned to China in the early 1980’s. And look at China today! Being in Yangon during the run-up to the recent parliamentary by-elections was an education in itself. 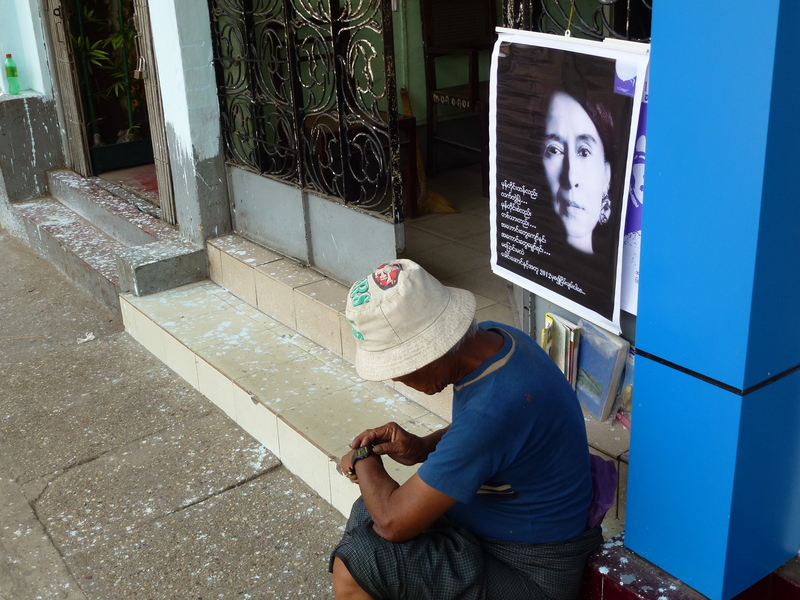 It was exciting to see Myanmar’s nascent democracy in action – election posters, campaign speeches, media coverage, the international press and many foreign observers. Aung San Suu Kyi’s National League For Democracy (NLD) won 43 of the 44 seats it contested, surprising given concerns about voter intimidation, harassment and other irregularities. Opposition leaders in many Asean countries must surely envy the NLD’s success rate. Although the military remains deeply unpopular, there is little appetite for retribution. People just want to move on, excited about the prospects for change and the chance for a better life. It’s the Burmese way, I suppose. The generals surely cannot have any illusions about how little support they have and how revered Suu Kyi still is despite all their efforts to isolate and marginalise her. They must know that in free and fair elections they would stand little chance. All the more amazing then that they should continue to acquiesce to the reform process. That in itself says something about their commitment and perhaps, their confidence in managing change. If the generals hold steady on the reform process, they would have proven themselves far wiser than military rulers elsewhere who have doggedly clung to power till they are forcibly evicted. Evolutionary change is always more pleasant than revolutionary change. In President Thein Sein, the people, the opposition and the military also appear to have found a man whom they can trust to manage the transition and balance competing interests. Foreign visitors who have met him have consistently come away impressed by his sincerity and commitment to reform and see him as genuinely determined to make peace with his country’s tribal minorities. Crucially, even Suu Kyi has endorsed him saying he is someone she can work with. He might not be a paragon of democratic virtue but he might just be what is needed to move the country out of its dark past and into a brighter future. He will need time and much support to succeed. Prime Minister Datuk Seri Najib Tun Razak, during his March visit to Myanmar, pledged our full support for the country’s process of democratisation and development. We may not have much to teach them about democracy but we can help in other ways [Deleted by the Star]. Our experience as a developing country might be of some relevance. We can certainly help with capacity-building and training while expanding upon our already significant investments in that country. More than anything else, however, we can make an immediate and meaningful contribution by reaching out to the estimated 80,000 Myanmar nationals who are now living in Malaysia as refugees. They have been abused, trafficked, whipped and shabbily treated for far too long. It’s time to right this wrong. Instead of importing yet more foreign labour, we should immediately offer them temporary employment and legal protection. The remittances they send back will provide a much needed boost to Myanmar’s economy while meeting an urgent need here. Eventually, they will return home to a new and better nation.